A month ago or so I wrote about some pretty pick me ups, and I just realized I never let the two products shine all on their own outside of that feature. If you have a hankering for something new and *gorgeous* not just in the packaging but also to wear, you need to check out Paul & Joe. I get positively giddy just looking at their makeup. It reminds me of when I was in grade school and would use Lisa Frank notebooks- they were eye candy and I just wanted to stare. Now that I’m older and don’t own any LF stuff, these are filling that void for me. 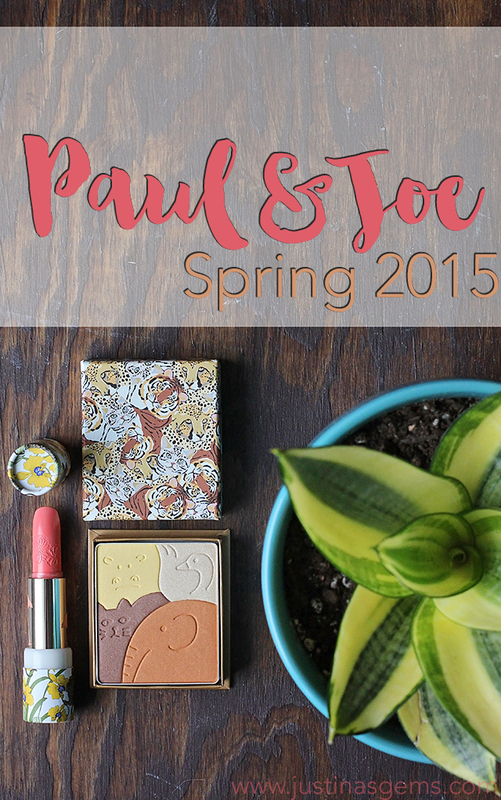 Paul & Joe Face and Eye Color in Giraffe and Ménagerie lipstick are part of the Spring 2015 collection. 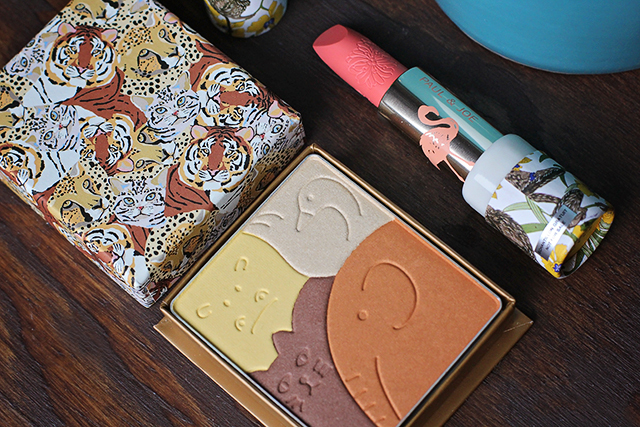 The Face and Eye Color was inspired by some of the world’s most elegant creatures- flamingos, giraffes and elephants, and the luxe powders have a generous amount of product in them to wear as eyeshadow, blush, or highlighter. These come in three shades- I love the one I have here as a neutral but Éléphanteau and Les Flamantes Roses are also gorgeous. I love the embossing on these! The hippopotamus is an accent color, the cat is an eye color, the swan is a highlight color, and the elephant is a cheek and eye color. I didn’t think the yellow was going to work for my complexion, but it’s actually pretty soft and I was pleasantly surprised by how well I liked it! In this picture, I am wearing all of these shades on my lids! I really like how fresh and pretty the colors are and I’m getting a ton of use out of them, although it does seem a little sacrelig to dip my eyeshadow brush into the adorable little animals. The embossing is deep enough that I could use this a LOT without destroying the cuteness of it though, so there is that. Ménagerie lipstick is a fresh coral that I am also loving. There is a red and a beige lipstick within the collection as well, but I am really digging this shade! It goes on my lips super smooth and is highly pigmented as you can see. These have Lavender Oil and Cocoa Seed Butter for emollience in the formula, and I can definitely tell it’s more moisture than I get with any old lipstick. I was surprised by how bright this was but I love it and it looks fantastic paired with the Face and Eye Color above! Have you tried any of these? Have you seen them anywhere else? I just have to go gaga for the gorgeous packaging, too cute!